Get to know our faculty and graduate students. 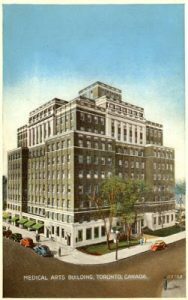 Vintage postcard of the Jackman Humanities Building (formerly the Medical Arts Building); date unknown. Image courtesy of John Chuckman. The St. George campus houses a variety of undergraduate programs as well as the tri-campus Graduate Department of Philosophy. With more than 80 courses offered every year, we offer our students the most comprehensive programs in the field. Our department is housed in the historic Jackman Humanities Institute (formerly known as the Medical Arts Building) in the heart of downtown Toronto. One of the city’s finest examples of Georgian-influenced architecture (originally built in 1929), the building is named in recognition of the Honourable Henry N.R. Jackman‘s outstanding philanthropic support of the arts and humanities at U of T.
Through an unparalleled selection of undergraduate courses in philosophy, students are introduced to the central branches of philosophy as well as the breadth of historical and contemporary philosophical thought in a variety of traditions. Specialist, Major, and Minor programs are offered, along with a concentration in Bioethics as well as the chance to enroll in Combined Specialist programs with other University of Toronto departments and faculties. Current and prospective students are encouraged to explore the Program Requirements page for detailed information on program fulfillment, course information, course groups, and more. This information can help you decide what types of philosophy programs and courses are right for you. Undergraduate students on the St. George campus have access to a wide variety of extra-curricular resources and activities, such as Noesis: the Undegraduate Journal of Philosophy, the Philosophy Course Union, and the Socrates Project, among many others. To learn more about how to apply to undergraduate studies in philosophy at the University of Toronto, please visit the U of T Application Information website. Our department is the top-ranked philosophy program in Canada, and one of the leading philosophy departments in the world. With over 50 graduate faculty active in both teaching and research, we are able to offer supervision in all major areas of philosophy, as well as a broad range of graduate courses every year. Graduate students have the opportunity to attend and organize events as part of a very active calendar of lectures and conferences. In recent years, our students have published papers in journals such as The Journal of Philosophy, Philosophical Studies, Philosophical Quarterly, Analysis, British Journal for the History of Philosophy, and Philosophy of Science. Much like our faculty, our graduate students are consistently the recipients of numerous awards and honours, including the prestigious Vanier Canada Graduate Scholarship. Every graduate student we admit is guaranteed financial support for the prescribed duration of the program, which fully covers tuition, fees and health insurance, and also includes funds for living expenses. To learn more about applying for graduate studies in philosophy at the University of Toronto, please visit the School of Graduate Studies application information page. The Department of Philosophy acknowledges the land on which the University of Toronto operates. For thousands of years it has been the traditional land of the Huron-Wendat, the Seneca, and most recently, the Mississaugas of the Credit River. Today, this meeting place is still the home to many Indigenous people from across Turtle Island and we are grateful to have the opportunity to work here.